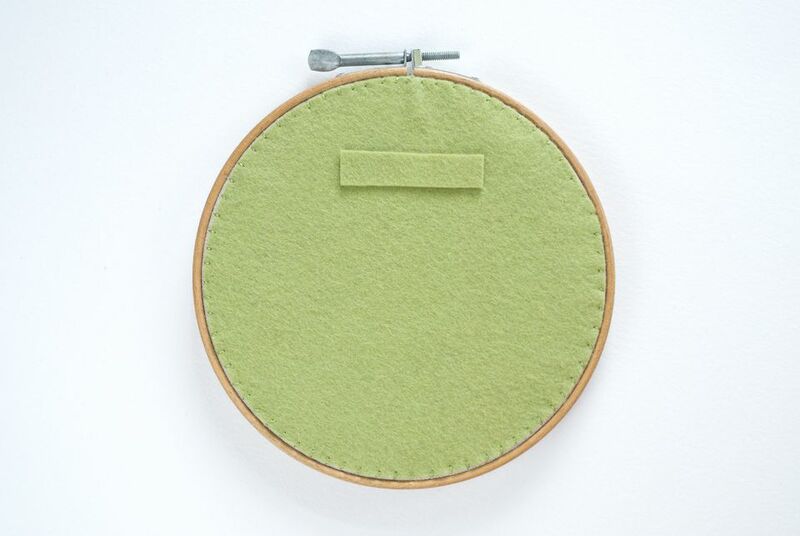 Embroidery hoops are a must-have tool for stitching, but they're also perfect for framing your finished embroidery. 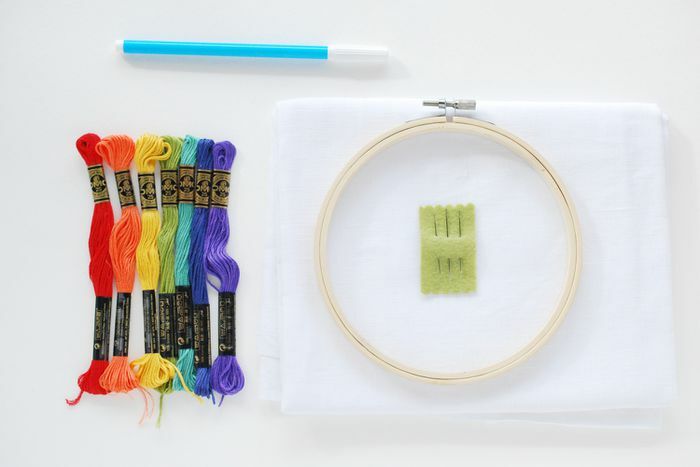 Learn how to frame your next embroidery piece in a simple wooden hoop. Not only does the hoop framing method work well and look good hanging on a wall, but it's also easy and inexpensive. There are a variety of techniques for framing in a hoop and this tutorial shows just one of the options. This version works well for covering the back of your work and making a way to hang and/or label your embroidery. This is especially good for when you are making a hoop for a gift, as it looks more finished and professional. This technique isn't limited to embroidery. It will work with most needlework, but it's also an option for framing quilt squares or plain fabric that has a print you want to feature. To give your frame even more of a finish, try painting the hoop or adding other embellishments. And for a classic look, use a vintage embroidery hoop. Separate the pieces of the embroidery hoop and use the inner hoop as a template. Trace around the hoop onto the felt, then cut out the felt circle. Set this aside for a later step. Place your embroidery securely in the hoop. When you press the outer hoop in place, make sure that the hoops are flush and that the inner hoop doesn't protrude in the front. It's best if the outer hoop isn't pushed all the way down. This will leave the edge of the inner hoop exposed on the back. If you are using a vintage hoop that no longer will hold the fabric taut, try wrapping the inner hoop for better tension. Trim around the excess fabric leaving at least 1/2 inch of fabric. Leaving 1 inch of fabric is better. Be sure to plan ahead for this when choosing your hoop size or cutting your embroidery fabric in the beginning. Thread a needle with enough thread to go all the way around the circle. Sewing thread, embroidery floss, or perle cotton will all work for this. Tie a large knot in one end. Sew around the edge of the excess fabric with large running stitches. The stitches should be about 1/4 inch from the fabric edge. When you reach the beginning of the stitches, pull the thread to gather the edges in toward the center. Take a back stitch or two to secure the gathering, then tie a large knot close to the fabric. Grab the circle of felt that you set aside. If you want to label the back of your work, this is the time to do it. Embroider your name, the date or a special message on the felt. Another option is to write or stitch onto twill tape and stitch that onto the felt. To make a hanger on the felt, cut a small strip of felt and attach it near the top of the circle with a dab of fabric glue at each end. If you'd rather, stitch the felt strip in place with a few stitches at each end. Place the felt circle on the back of the embroidery and stitch around the edges. Come up through the gathered fabric, near the hoop, then go down through the felt at an angle so you can catch the gathered fabric for the next stitch. Continue all the way around the hoop and then secure the end with a hidden knot. Another pretty way to hang an embroidery hoop is to tie a loop of ribbon, lace or fabric through the tightening screw. Now your embroidery is ready for displaying, gifting or even selling.